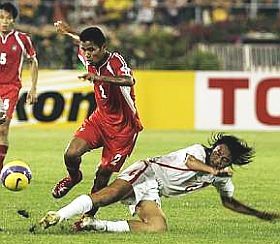 After forcing a 0-0 draw with Vietnam, Thailand will face Singapore in the ASEAN Football Championship this Sunday. The match is sure to be extra intense due to the recent diplomatic flare up between the two nations caused by the shady business dealings of the former Thai prime minister. In other sports news, Thailand's ice hockey team was defeated 4-0 by the United Arab Emirates at the opening match of the Asian Winter Games. The Thai team next faces Kazakhstan, which routed UAE 38-0.